The issue begins with the mysterious woman, overly bored; she breaks down the exit doors and begins to head out to see the world. Right before she leaves, a recording from Ezekiel begins playing. He tells her that she is a danger to herself and to the rest of the world. He further states: i know you will do the right thing. With these carefully selected words, Cindy, the mysterious woman with spiderlike powers, changes her mind. 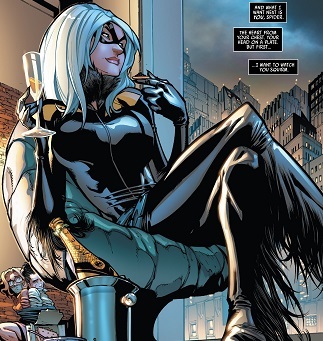 The Upper East Side, the black cat is more villainous than ever as she breaks into a pent house, ties up the residence and snacks on their expensive champagne and caviar. She is now more than ever determined to bring down the spider that has thrown her world upside down. Parker industries, Peter parker arrives to work on casual Friday and announces that they will be going on a field trip to test out their new tech which is designed to find electro. Sajani and Anna Maria stay behind to do some real work. But Anna might be over her head since she does not understand the work of Dr Otto Octavious. The doc never shared his work with anyone. Doc ock’s robot enters the room and asks Anna if she needs any assistance. Want More Free Online Comics In Video Format? Please Click Here. Across town, Jameson meets with a talk show host and he rages on about his resignation in office. Jameson truly blames Spider-Man for all of the mishaps in his life. Jameson was shocked and devilishly excited when he discovers that the studio is offering him his very own show. Alphabet city, the homeless electro wakes up from a nightmare. Due to his unstable body, the sparks create a fire and he narrowly escapes. Hours later, the fire fighters arrive on scene along with parker and his gang. Ollie, Mary Jane’s new firefighter boyfriend heroically enters the burning building to save a young girl. But he may be in over his head. Luckily for him, parker snuck away and suits up to save the day. the two manages to save the little girl but Ollie steps into a crack and becomes trapped. 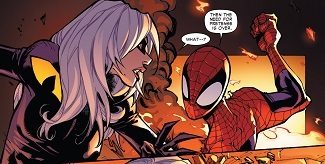 Black cat arrives and instead of assisting, she takes out her anger on Spider-Man. Parker deduces that the cat was wronged by Otto. With his quick thinking, Spider-Man mimics the verbiage of the superior spider. Confused and outmatched, black cat retreats to fight another day. Spider-Man emerges from the burning building with Ollie and as MJ arrives to meet her boyfriend, peter swings off to allow the woman he loves some alone time with her new boyfriend. A couple of blocks away, with the help of the stolen tech from parkers employee, black cat locates electro and offers him a deal. Together, they can get rid of Spider-Man. Marvel Comic Books Review: Amazing Spiderman # 3 Review. So I want to talk about the best scene for me which am the first few pages but before I get into that, I want to talk about this issue as a whole; Great beginning, great mid but bad end. What i mean by this is, at the end, we get a very familiar comic book super villain ending where one bad guy, in this case bad girl, meets with another villain and offers a truce and partnership in order to take down their common cause. I mean this was how the sinister 6 was created and they couldn’t take down Spider-Man. How’s the cat and electro gunna do what 6 super powered villains couldn’t? I don’t mind them teaming up, but to have it as an ending to issue 3 was a bit of a letdown. But this is just my opinion, please let me know your thoughts in the comments below. Alright so lets discuss what made this comic worked for me. I love the supporting characters more than Spider-Man in this issue. Jameson getting a talk show and we know that he is gunna spread propaganda and make Spider-Man look like a menace. Back to good old times if you ask me. Also, Anna maria now potentially has access to doc ocks intellect in the form of his robot. Wouldn’t it be cool if dock ock commanded the robot to fully obey Anna? This would give Spider-Man such a new dynamic that is never done before. I mean yes, Spider-Man is friends with some of the most intelligent people in the world, but this is Anna, his co-partner c0-owner of parker industries. I’m really enjoying the character of Anna maria Marconi and i hope the writers don’t do anything silly and write her out of the Spider-Man stories anytime soon. so Ezekiel is a super rich business man whom, at a younger age, gained powers similar to Spider-Man. He had a heroes heart and wanted to do good but he got wrapped up in his business and never took the time to save lives much like Spider-Man did. Now Ezekiel was the one person who told peter parker that their powers were more than a science experiment gone wrong and a radioactive spider bite could cause spiderlike powers. He explained the nature of animal totems: people who gain supernatural abilities from a mystic link with certain animals. Ezekiel suggested that the spider that bit peter was not mutated by the radiation, but actually trying to give peter its powers before the radiation killed it. So, last we heard, Ezekiel is dead. So now the question is, was that just a recording from a long time ago? Or did Ezekiel somehow survived and is still in the land of the living? What do you guys think, let me know in the comments below. Thanks for checking out my marvel comic book review on the amazing spiderman 3. As promised, below is the video format to this article. Enjoy!